Whether you manage a gym or use the facilities as a customer, a health and safety policies that spells out what employees and gym users need to do to reduce risk is a valuable tool. According to Smart Money, gyms are not legally required to have personnel trained in CPR and only a handful of states require gyms to have defibrillators on site. Smart gym customers make sure the gym they frequent has a good policy. A health and safety policy should include provisions for staff training. Staff members should know CPR and first aid. If a defibrillator is kept on-site, staff members should have training regarding proper use. The American College of Sports Medicine, or ACSM, recommends that all fitness professionals that instruct or supervise physical activity of staff or customers have the appropriate education or certification as well as experience. 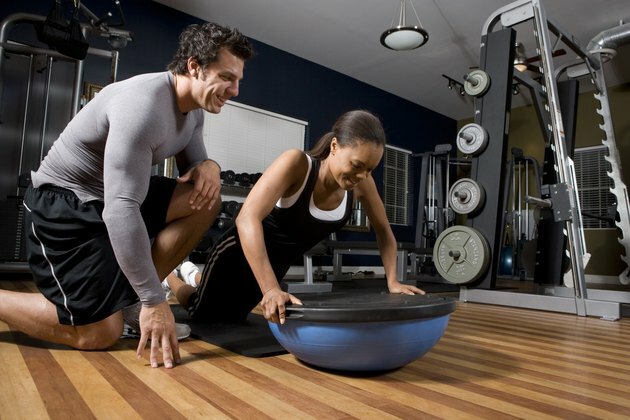 The Society for Human Resource Management recommends that gym members have a fitness assessment before using a facility. The ACSM agrees and goes a step further, suggesting a cardiovascular fitness risk screening and a health questionnaire. The results should be interpreted by qualified personnel. New members should also be given an introductory tour of the facility and instruction in the safe and proper use of machines. The fitness equipment used in a gym, such as treadmills and weight machines, need regular maintenance for safety. A policy in place regarding equipment upkeep improves function and safety. According to Smart Money, equipment also needs proper positioning. For example, if treadmills are located too close to a wall, a person who falls off the belt could hit the wall, incurring injury. Gym policy should require that staff receive training in the operation of any new equipment in the gym. The ACSM recommends that gyms design a written policy regarding emergencies. The system and its procedures require rehearsal on a regular schedule, ensuring readiness of staff to handle minor first aid events as well as serious emergencies. Gyms should have an entry system in place so that only members and staff may enter. This lowers the risk of theft and other crimes. The ACSM says that for youth programs, there should always be proper supervision while youth are in the facility. Signs become an important safety tool when posted where all can see. Safety rules should be clearly spelled out on signs. Warning and caution signs need to be posted, as well as fire and emergency signs required by local, federal and state codes.